A very close match against Warwick Evans and Nigel Messenger, played in mostly fine conditions on Saturday 12th August. Jamie and Brian held a 1-up lead after 9 holes. All square after 10, All square after 12, ….you get the picture ! 13 & 14 took a slight turn with Jamie & Brian going to 2-up, 4 holes to play. But Warwick and Nigel were not done yet. Halved #15, halved #16, dormie-2…….but then it happened….Brian & Jamie found their final touch of finals form on #17 and took that hole to win the match, 3/1. Congratulations to Jamie & Brian, commiserations to Warwick & Nigel, on the outcome of match played in the best possible spirit, lots of laughs, encouragement and good will. 2017 is the first time Ade Waddell Memorial Trophy has been contested since 2004 – that’s quite a few years ago and while there was not a full field to start the event this year, interest was keen and we look forward to increased participation in 2018. Club President Allan Fayen presented the trophy to our 2017 Ade Waddell Champions and expressed his thanks to all who participated in the event and appreciation for its re-introduction. He too looks forward to increased participation and seeing himself being a strong contender for the 2018 title. 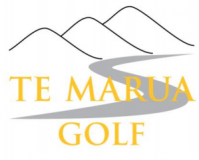 Congratulations Jamie & Brian, maybe 2018 will be the year for Warwick & Nigel – or another dynamic duo from Te Marua Golf Club.